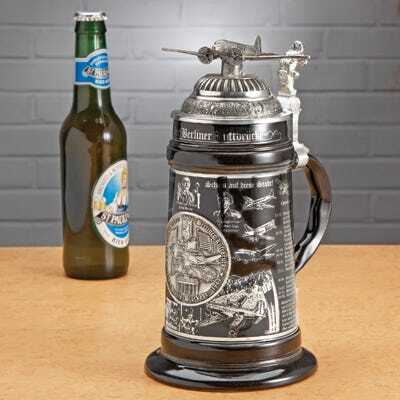 This impressive Limited Edition Berlin Airlift Stein honors those who participated in protecting the freedom of West Berlin until the blockade was lifted in 1949. The body is a smooth, black glazed high quality stoneware decorated with a platinum wrap around design that features several images of airplanes, portraits and a timeline on both sides. A pewter medallion featuring a map of Berlin surrounded by monuments, the British Flag, the American Flag and the words Berlin Airlift has been pressed onto the front of the Stein. 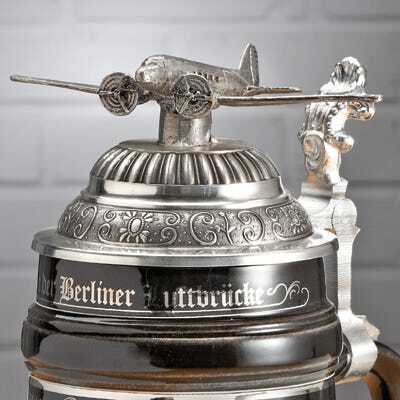 The Stein is completed by an ornamental pewter lid and handle with an intricately detailed figure of a n airplane placed on top. All major components of the Stein were crafted by skilled artisans in Germany. Stein measures about 9.5”h x 5”w and holds 36 ounces. Includes a numbered Certificate of Authenticity stamped on the bottom of the Stein.